San Francisco BOOTIE SF: Bootie Prom! It's the Bootie Prom! Your favorite mashup party celebrates Prom season by throwing "a Prom for the rest of us!" Come as you are or dress up in creative Prom attire for a chance to be crowned the Bootie Prom Queen, Prom Queen, or Best Couple! $100 ca$h prize$! Four rooms, one price! A Prom for the rest of us! 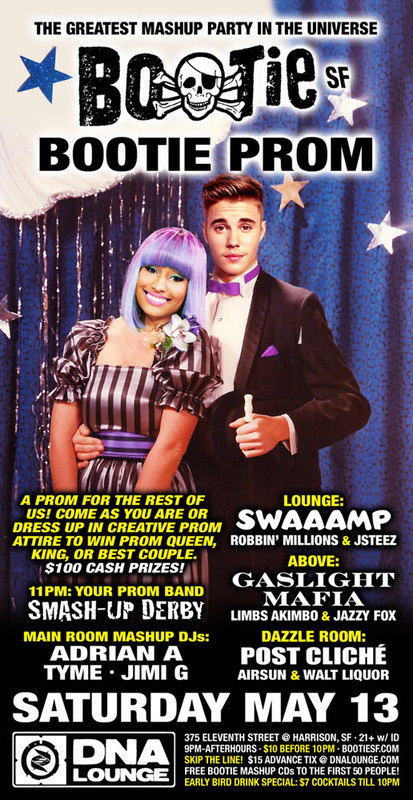 Come as you are or dress up in creative Prom attire to win Prom Queen, Prom King, or Best Couple. Contest at midnight! $100 ca$h prize$! Bootie celebrates Prom season with “a Prom for the rest of us!” Dress up in creative Prom attire for a chance to win $100 cash prizes, with you, the Class of 2017, deciding the winners! Your chaperones for the evening will be resident DJs Adrian A, Tyme, and JimiG, while at 11 PM your Prom band Smash-Up Derby takes to the stage, playing a special set that will include a bunch of classic Prom favorites! Upstairs in the Lounge, it’s Swaaamp, as disco, house, and more gets purposely pitched down 10% for a thick, swampy, bent and funked-slowly sound, while in Above, Gaslight Mafia manipulates classic swing and jazz with modern sounds, plus Post Cliché takes over the Dazzle Room, keeping you moving on the dance floor! Drag chaperones Suppositori Spelling and Qween make sure you’re not doing anything they wouldn’t do, while club photographer ShutterSlut captures you in your Prom finery! Plus there are FREE Bootie mashup CDs to the first 50 people!